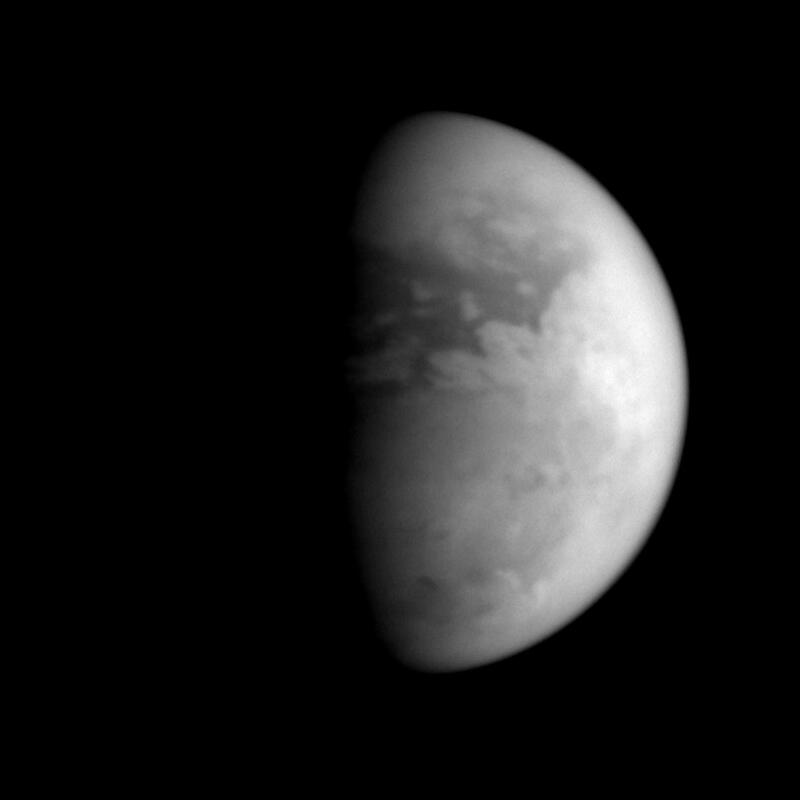 Titan's equatorial latitudes are distinctly different in character from its south polar region, as this image shows. The dark terrain, presumably lowland, seen here does not extend much farther south than about 30 degrees South. The successful Huygens probe landed in such a region. The Huygens probe is rotating into the light here, seeing the dawn of a new day. The bright region toward the right side of Titan's disk is Xanadu. This area is thought to consist of upland terrain that is relatively uncontaminated by the dark material that fills the lowland regions. Near the moon's south pole, and just eastward of the terminator, is the dark feature identified by imaging scientists as the best candidate (so far) for a past or present hydrocarbon lake on Titan (see PIA06241 ). Farther east of the lake-like feature, bright clouds arc around the pole. These clouds occupy a latitude range that is consistent with previously-seen convective cloud activity on Titan. Titan is Saturn's largest moon, at 5,150 kilometers (3,200 miles) across. The image was taken with the Cassini spacecraft narrow angle camera on July 7, 2005, at a distance of approximately 1.3 million kilometers (800,000 miles) from Titan and at a Sun-Titan-spacecraft, or phase, angle of 60 degrees. The image was obtained using a filter sensitive to wavelengths of infrared light centered at 938 nanometers. The image scale is 7 kilometers (5 miles) per pixel.